As fears continue to rise in Japan and around the world about a potential nuclear disaster, Japanese officials are scrambling to find new ways to cool the nuclear reactors, and prevent a full scale nuclear meltdown. After Thursday’s attempts to cool the fuel rods failed, military fire trucks are now spraying cold water onto the rods to help expedite the cooling process. While nuclear plant officials try to do everything that they can to help prevent a meltdown, the United State’s top nuclear official warned that it will more than likely “take some time, possibly weeks,” to repair the plants. Not only is the inability to cool the fuel rods at reactor No. 3 a major problem at the Fukushima Daiichi Nuclear Power Station, but U.S. officials feel that the threat that reactor No. 4 poses is even greater than the threat posed by reactor No. 3, which Japanese officials have led us to believe is the main threat. 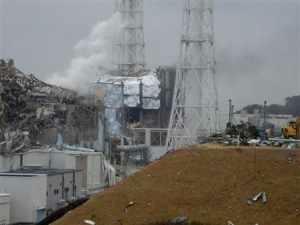 However, Japanese officials continue to focus their efforts on prevented a full scale meltdown of reactor No. 3 since it contains a mixed fuel known as mox, which stands for mixed oxide. If mox is released into the atmosphere, the damage that can be done to the environment surrounding the reactor could be catastrophic. It is too early to tell how effective the military fire trucks are when it comes to cooling the fuel rods, but helicopters and water cannons are also being deployed to help with the efforts. Some of these rods have needed cooling for the last 20 years, hope the fire trucks are durable, they will have to operate a long time if the pumps don’t work. What we need now is to air drop 620 million tons of concrete on the site. Something like the Berlin Air lift of the ’50s. Start constructing Air Craft now.